Israel, Jordan, Palestinians Strike Water-Sharing Deal : The Two-Way Under the agreement, Jordan would build a desalination plant and a pipeline would be built from the Gulf of Aqaba to the Dead Sea. 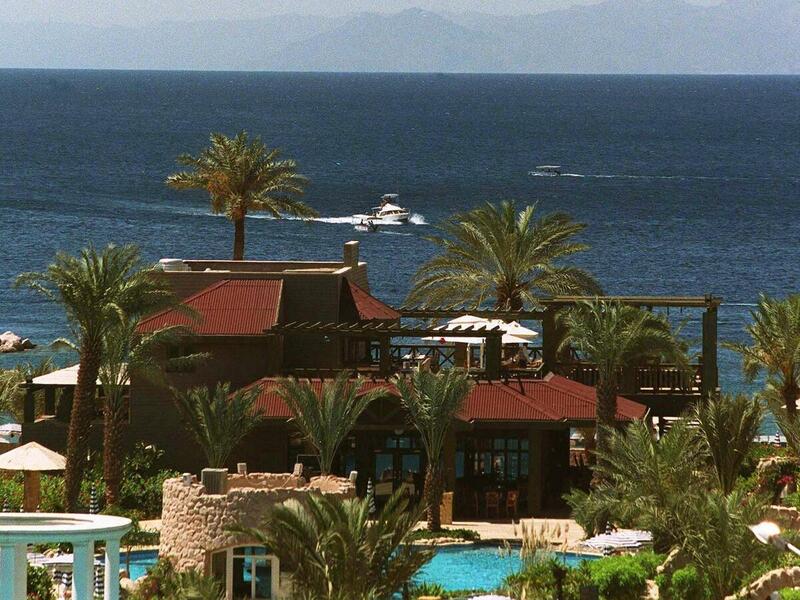 The Gulf of Aqaba, near the Jordanian city of the same name. Under a new agreement, Jordan would build a desalination plant near here. Israel, Jordan and the Palestinians have agreed to a water-sharing pact that would see the construction of a desalination plant on the Gulf of Aqaba on the Red Sea and bring "a long-awaited Red Sea-Dead Sea pipeline one step closer to completion," according to Reuters. The plant would be built on the Jordanian side of the Gulf and the resulting potable water would be shared between Jordan and Israel. Alexander McPhail, the lead water and sanitation specialist in the World Bank's Water Practice division, tells The Jerusalem Post Monday that in return, "Israel will increase the annual releases of water from Lake Kinneret to Jordan and will also increase its sales of water to the Palestinian Authority." "'It's like a swap,' McPhail told the Post, regarding the Israeli and Jordan portions of the agreement. 'Israel needs water in the south because they want to settle that part of their country. Jordan needs more water in the North.'" Israel's Regional Development Minister Silvan Shalom said in a statement that the pact includes building a 112-mile pipeline northward from Aqaba to the Dead Sea at an estimated cost of $300 million to $400 million. "That study examined various plans to halt the shrinking of the Dead Sea, whose restorative powers have attracted visitors since biblical times. The lowest place on Earth has lost a third of its surface area from drought, agricultural diversion and pumping to extract minerals for fertilizers." "'This is a breakthrough after years of difficulty and struggle,' Shalom said on Army Radio of a pipeline he estimated will take three years to build to the benefit of each side economically and environmentally."